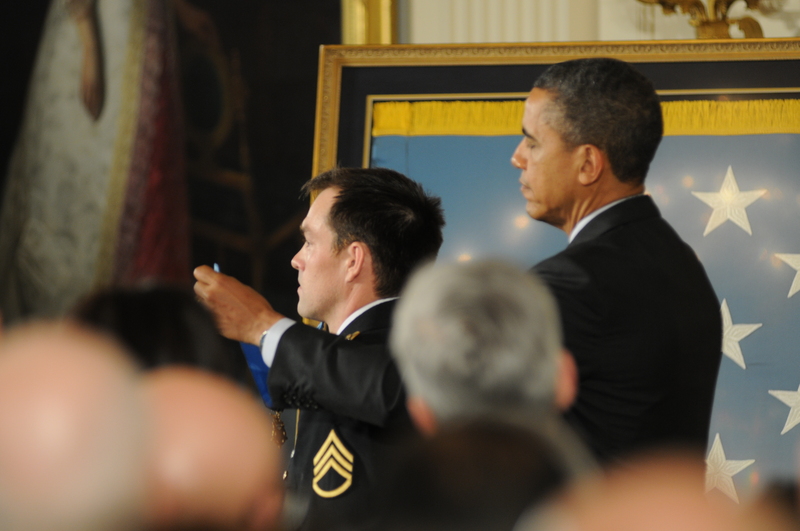 WASHINGTON (Feb. 11, 2013) -- President Barack Obama placed the Medal of Honor around the neck of former Army Staff Sgt. Clinton Romesha during a ceremony Feb. 11 in the East Room of the White House. Romesha is the fourth living service member to receive the medal for service in Operation Iraqi Freedom or Operation Enduring Freedom. The former Soldier earned the Medal of Honor for actions Oct. 3, 2009, at Combat Outpost Keating, Kamdesh District, Nuristan Province, Afghanistan. President Barack Obama placed the Medal of Honor around the neck of former Army Staff Sgt. Clinton Romesha during a ceremony Feb. 11, 2013, in the East Room of the White House. On that morning, Combat Outpost, or COP, Keating, manned by only 53 Soldiers and situated at the bottom of a steep valley, came under attack by as many as 300 Taliban fighters. "Throughout history, the question has often been asked, why? Why do those in uniform take such extraordinary risks? And what compels them to such courage?" the president said. "You ask Clint and any of these Soldiers who are here today, and they'll tell you. Yes, they fight for their country, and they fight for our freedom. Yes, they fight to come home to their families. But most of all, they fight for each other, to keep each other safe and to have each other's backs." The White House ceremony was attended by several hundred, including lawmakers, defense leaders, Romesha's family, and team members from Romesha's own Bravo Troop, 3d Squadron, 61st Cavalry Regiment, 4th Brigade Combat Team, 4th Infantry Division. Also there was Secretary of Defense Leon E. Panetta, Chief of Staff of the Army Gen. Ray Odierno and Sgt. Maj. of the Army Raymond F. Chandler III. The president said that upon learning he would receive the Medal of Honor, Romesha displayed the brand of humbleness typical of many Soldiers. "When I called Clint to tell him that he would receive this medal, he said he was honored, but he also said, 'it wasn't just me out there, it was a team effort,'" the president said. "And so today we also honor this American team, including those who made the ultimate sacrifice." "Each of these patriots gave their lives looking out for each other," Obama said. "In a battle that raged all day, that brand of selflessness was displayed again and again and again, Soldiers exposing themselves to enemy fire to pull a comrade to safety, tending to each other's wounds, (and) performing 'buddy transfusions,' giving each other their own blood." 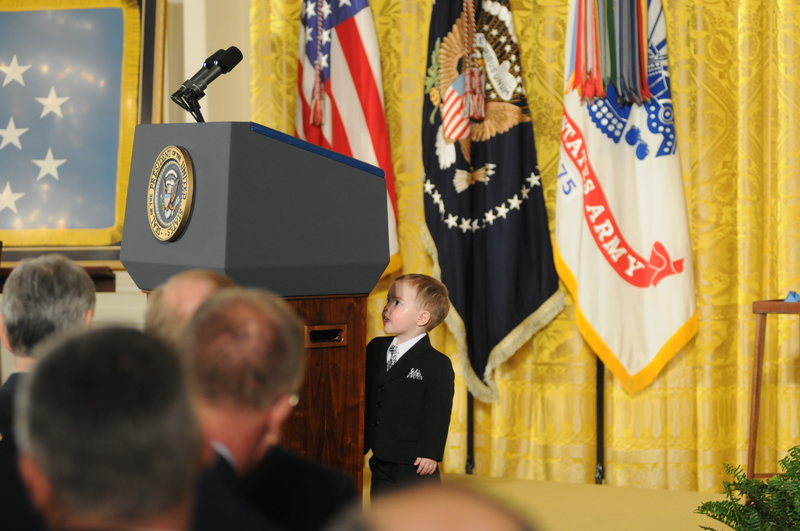 In advance of the Feb. 11, 2013 Medal of Honor ceremony in the East Room of the White House, Colin Romesha, son of Medal of Honor Recipient former Staff Sgt. Clinton L. Romesha, investigates the lectern that would later be used by President Barack Obama. The president said on that day, it wasn't just Romesha who earned recognition for his actions, it was dozens of Soldiers. From that battle, Soldiers earned 37 Army Commendation Medals, 27 Purple Hearts, 18 Bronze Stars and nine Silver Stars, the president said. "These men were outnumbered, outgunned and almost overrun," Obama said. "Looking back, one of them said, 'I'm surprised any of us made it out.' But they are here today. And I would ask these Soldiers, this band of brothers, to stand and accept the gratitude of our entire nation.